While your roof is designed to withstand the elements, some storms are more intense than others. There are signs to look for when you believe there may have been damage to your roof. Please be safe when inspecting your roof - possibly view from a window inside the house or use binoculars from the ground. If in doubt, call a professional roofing contractor - such as DunRite Exteriors. Usually hail is not something that you can miss - it is typically a widespread weather event in a neighborhood and not isolated to just one house on the block. Hail can bruise a shingle causing an indentation that may be hard to see but that can crack the shingle allowing water to infiltrate over time. 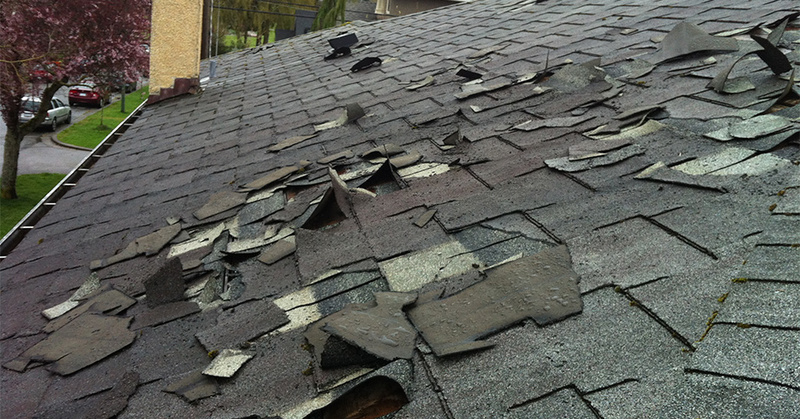 You may need the assistance of a professional roofing contractor to determine the scope of the damage. If you have hail damage, you will need to file an insurance claim. Strong storms cause billions of dollars worth of damage to homes across America each year. Wind, hail and ice can affect the life of your roof. DunRite can help you restore your home after Mother Nature takes its toll. Many homeowners may not be aware that their homes were damaged from a storm. It is important that you have your property inspected in a timely manner. After a thorough inspection, we will let you know if there is enough damage to file a claim. Ultimately, it is up to your insurance adjuster to determine if they are going to pay out on a claim. All insurance companies have timelines for filing claims, and if you delay, it is possible that your insurance company may not approve your claim. Your first step should be to contact DunRite Exteriors for a Free Storm Damage Evaluation! Regardless of how urgent your roof repair needs are, remember that it is always best to secure a reputable locally owned Ohio roofing contractor rather than getting involved with a fly-by-night storm chaser. With that being said, give our qualified team members at DunRite Exteriors a call today to get started!